Is RV Parking Available in Boston? Where to park an RV in Boston? We are staying at Wompatuck State Park with our 30 foot RV and want to visit Boston from there. 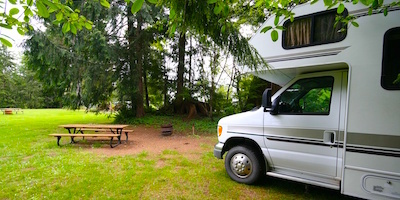 Is there any parking facility for RVs in Boston? As far as I am aware, Boston does not have RV parking, nor can RVs be parked at commuter rail or T (Boston's subway) stations. 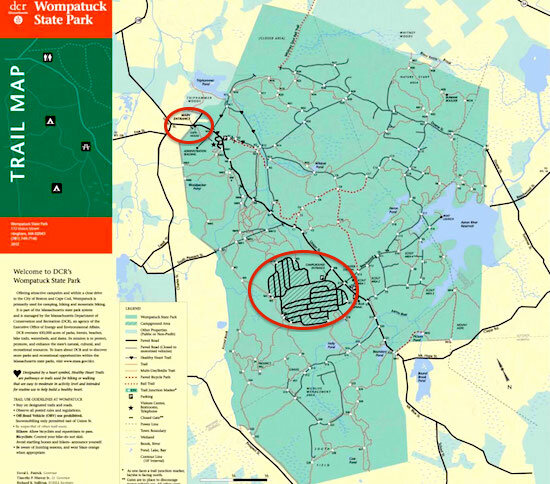 However, if you will have bicycles with you, you can bike from Wompatuck State Park in Hingham to West Hingham Station on the Commuter Rail's Greenbush Line. Boston is only about a 35 minute train ride from the West Hingham Station, located at the intersection of West Street and Bare Cove Park Drive. The train station is slightly less than 3 miles from the park's entrance. The RV campground is just over 1 mile from the entrance - so a total of 4 miles to get to the station. Because the distance is so short, the fare should be around $10-$15, maybe less, plus a tip. In case you're wondering if taking a taxi from the campground all the way to Boston would be a good idea, you should know that the fare (including tip) could run $80-$90 each way, depending on traffic. Scroll down to see more directions and a map, plus information about West Hingham Station. Here is more information about other RV parks close to public transportation to Boston. And here is more information about Boston's subway, the easiest way to get around Boston aside from walking. Wishing you a wonderful visit to Boston! Once you are on the train, you will arrive in Boston at South Station in the Downtown Financial District. From South Station, you can hop on the subway's Red Line to other Boston and Cambridge locations, or take the Silver Line to the South Boston Waterfront. However, most attractions in this part of the city are an easy walk from South Station. Head up the 1.2 mile Rose Kennedy Greenway, a beautiful ribbon-like park along the waterfront. You'll pass the New England Aquarium and Faneuil Hall Marketplace, and finally end up in Boston's North End, where you can walk along the historic Freedom Trail or savor some of Boston's best Italian food at one of the neighborhood's many mouthwatering restaurants. The West Hingham Commuter Rail Station is located at 20 Fort Hill Road in Hingham. Go to the Schedules and Maps section, and then to Rail Stations. You can also find information there about bike parking facilities at the West Hingham Station.